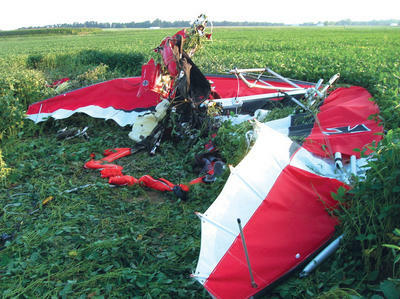 (SWITZ CITY, IN) - The autopsy reports of two men that were killed in a small plane crash have been released. The pilot, 68-year-old David C. Johnson of Linton and his passenger, 43-year-old Mark E. Muzii of Bloomington were flying what was previously thought to have been an ultralight aircraft. According to the Federal Aviation Administration, the aircraft was not classified as an ultralight but rather a light sport craft, or small plane. The two were killed upon impact of the crash as Johnson attempted to land the aircraft. Reports from yesterday's autopsy taking place yesterday morning in Terre Haute indicate that both men died as a result of massive internal injuries. Toxicology tests reports will not be released for approximately three weeks.